This was my favorite addition to the HO layout. There was an 11" gap between the back of the layout and the front of the shutters, and what better to fill its place than a DSF! The module was designed for maximum capacity in a tight space. 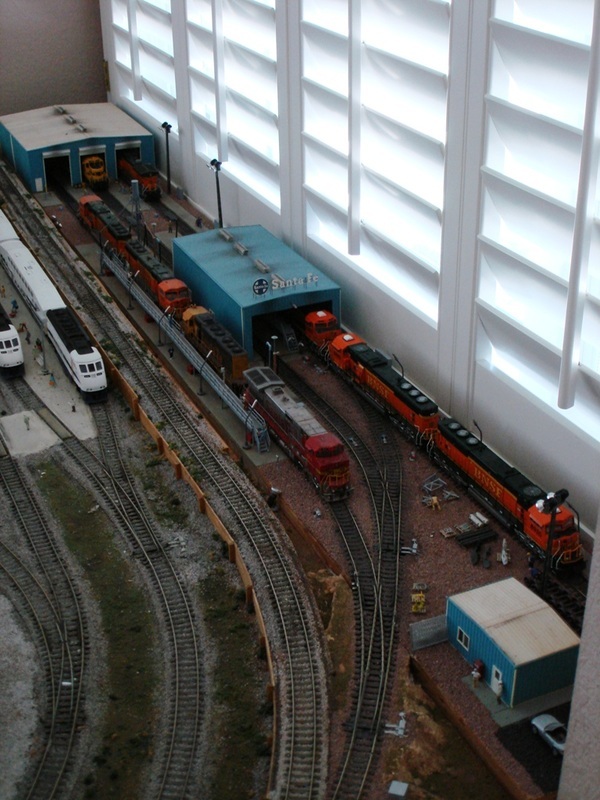 There are seven track positions capable of holding 18 locomotives. There are three locomotive repair tracks, two maintenance tracks, one Run In Place (RIP) track, and one ready track. The DSF is fully lighted complete with its own signaling system. The module was built down in the garage, away from the layout. Once it was complete, it was brought upstairs. A switch was spliced into the mainline and the diesel service facility was complete. All the buildings and repair tracks have numerous details from tool chests in the shops down to spare MU cables by the tracks. The buildings are loosely modeled after the Santa Fe shops in Barstow, CA.